Please the whole table with these Roasted Sweet Potatoes & Pineapple. 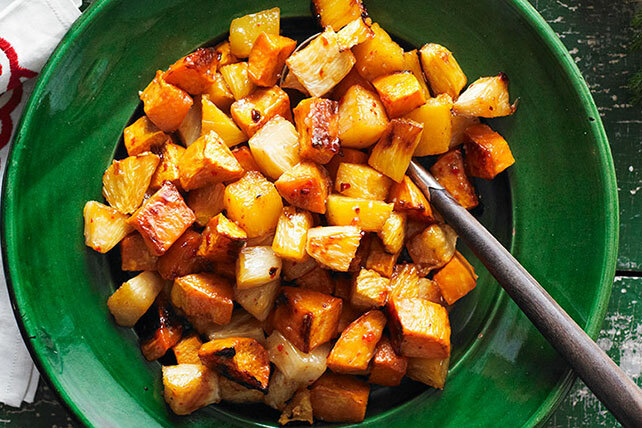 These Roasted Sweet Potatoes & Pineapple are the perfect mix of sweet and savory. Combine potatoes and pineapple in large bowl. Mix remaining ingredients until blended. Add to potato mixture; mix lightly. Spread onto rimmed baking sheet sprayed with cooking spray. Bake 45 to 50 min. or until potatoes and pineapple are tender and golden brown, turning after 30 min. For more flavor, add 1/4 tsp. ground red pepper (cayenne) to dressing mixture before tossing with the potato mixture. The sweet potato has been called a "superfood" since it is a good source of both fiber and potassium, and high in both vitamins A and C.